In 1829, Andrew Jackson became President of the United States. While Jackson had many accomplishments, he also was a controversial leader. Perhaps one of the saddest chapters in early American history is the relocation of the Cherokee Nation out of Georgia. 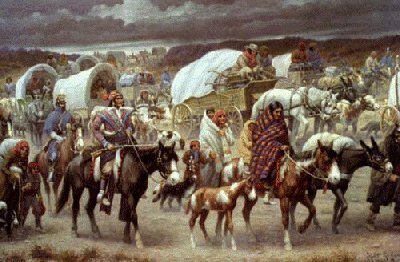 The forced March to present-day Oklahoma became known as the Trail of Tears due to the large number of Native Americans who died during the relocation. During break there is no homework assigned. If students want to work on their museum exhibit, they can use the time for that purpose. Monday - No homework. Students can work on their Museum Exhibit if they want to.